After five years and $10 million, Pittsburgh’s Mellon Square has been returned to its mid-century splendor. Dedicated in 1955, the Square served as a modern, green oasis in a city choked by pollution. But only a few decades after opening, the modern masterpiece had fallen into disrepair, its former glory hidden by cracked pavement, broken fountains, pigeons, and empty planters. 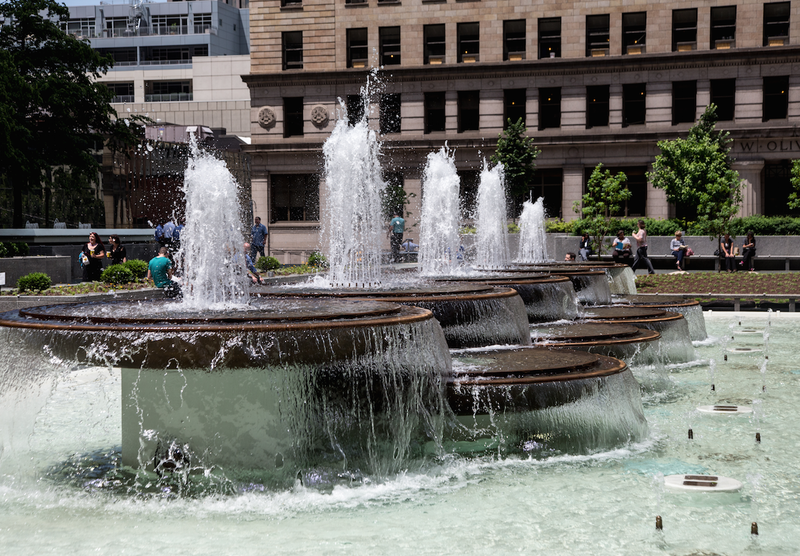 As Pittsburgh has transformed itself in recent years, so to has Mellon Square. Now, the reborn space is yet another example of the Steel City’s promising future. The park’s original design is the work of Mitchell & Ritchey and Simonds & Simonds who created a conspicuously geometric space with prominent fountains, planters, benches, and triangle-patterned concrete. 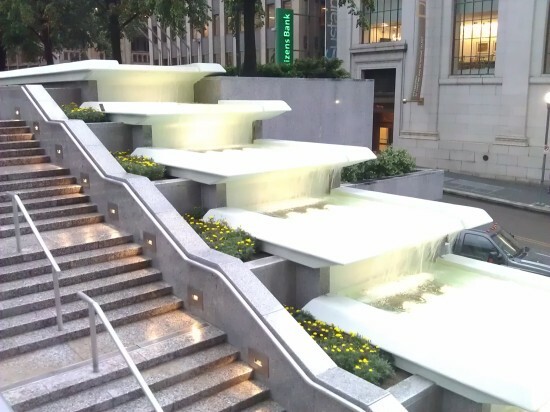 According to the American Society of Landscape Architects (ASLA), Mellon Square is the first park in America to be built on top of a parking garage. According to the ASLA‘s Dirt blog, “the intensive, compact Mellon Square design was layered, with three-dimensionally nested planes unfolding to a serene interior of skydome, sunlight, shimmering water, and native forest plants.” In 2008, the American Planning Association named Mellon Square one of its “great spaces.” At the time, though, the park was a dingy version of its former self. “Mellon Square had started to feel a little seedy and maybe even a little unsafe,” said the Pittsburgh Parks Conservancy in a video about the space. The renovation, led by Patricia O’Donnell of Heritage Landscapes, changed that. 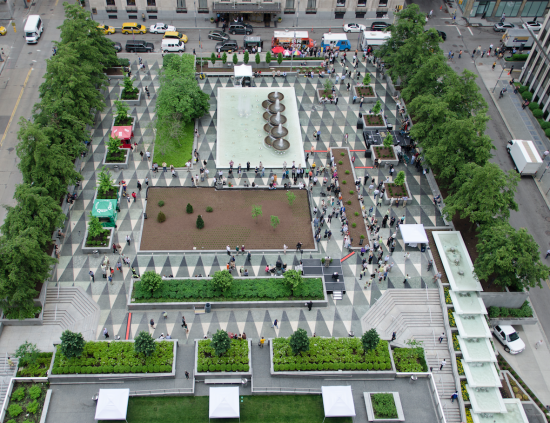 The pavement and fountains were restored, granite walls were cleaned and repointed, thousands of plantings were added, new lighting was installed, and a new terrace was created to expand the square’s usable space by 15 percent. To keep the park from falling back into disrepair, $4 million has been secured to cover maintenance and upkeep costs. 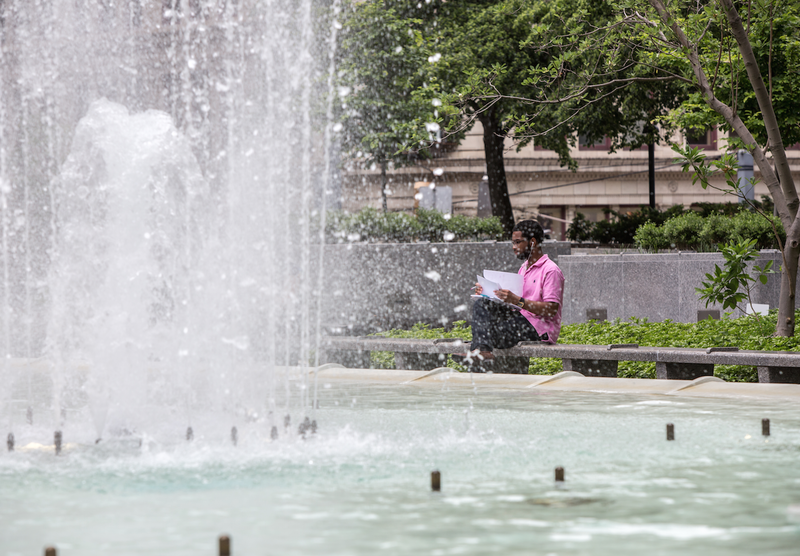 Above, the Pittsburgh Park Conservancy’s video on the history and restoration of Mellon Square.